Uh...and it would be a lever filler. I LOVE lever fillers and screw in nibs...it's a disease...can't help myself. It's most likely cost prohibitive but in a perfect world, a true lover of the Esterbrook Company like FPN's own Brian Anderson, would have revitalized the brand and developed a pen with multiple and affordable nib choices. So why doesn't someone make nibs for Esterbrook as it seems as though a lot of people want them? 1) What nib sizes do people want? Think about those questions, then consider that there isn't really an appropriate size nib out there right now, so someone would have to make the nib, a special stamping, and get the right and correct threading. It absolutely can be done, however, it is likely the cost would be in the $25-35 range per nib (retail), and a retailer would likely have to buy a minimum of 100-500 per size. Want a two tone option? Double the cost. I know what it cost to get JoWo nibs (just the nibs, no feeds or collars) made for EF, F, M, B, 1.1, and 1.5 in single and two tone and I don't think I would want to invest in nibs that would fit Esterbrook. Now that I've said that, here are the most obvious options (to me) for nib sizes: EF, F, M, B, 1.1 and 1.5 stubs or italics (to fit along with current trends today), someone will want a flexible nib (not going to happen), cursive Italic, needlepoint, or some other fancy nib. When I can buy most of those nib sizes quite readily available now in an original Esterbrook nib for $6-35, I don't see why anyone in their right mind would invest that kind of money to do it again. This would easily be a $10-15k investment (or more) for someone to do. I'll tell you that I have more nibs then I will sell in my entire lifetime and I am selling many of them for $6-15. The only way it even remotely makes sense is if a certain person who owned a certain trademark and a certain pen company actually made them and stamped a certain company name on them. They would also have to make an affordable pen that used those nibs so there were multiple opportunities to sell the nibs. If I owned that certain name I would likely do it, but the nibs would not be backwards compatible. If we were talking about replacement nibs for Wahl Dorics that might be different, since nobody has boxes and boxes of them lying around, but for Esterbrook, it just doesn't make any sense. I wasn't being totally serious in suggesting someone start making nibs for Esterbrooks. What I was really getting at was that there are so many who complain about the new Esterbrook not offering interchangeable nibs while at the same time - just like you stated above - there are all kinds of NOS nibs available. I know. Everyone wants a lever filled esterbrook with replaceable nibs. Some people ARE serious though, and if it were possible, you'd see a modern lever filler under $400, but you can't. Let's hope that this is an EXTREMELY Limited Edition. Why would anyone waste money on such tat? Honestly, when the genuine and superior articles are readily available for next to nothing, why would anyone buy such an inferior piece of (bleep)? And this is no anti-Esterbrook rant, per se: I am equally disgusted with the new trash cranked out not so long ago bearing the Conklin name. In the mean time, I am more than happy to buy my Esterbrook nibs from Brian and Lisa and am very grateful that they have a good supply of broad nibs. You can't turn back time, I guess, but thank heavens Richard Esterbrook made a nearly indestructible pen that I can still enjoy 70+ years later. To be fair, the Facebook post didn't say it was a celebration of his assassination, but rather a commemoration of his life to be released on the 150th of his untimely death. "To be fair", the OP didn't say "celebration" either. I wonder what the box will look like that houses this pen? You are quite right. It was farther down the thread that commemorate was mentioned. I got my "c" words mixed up and didn't go back up thread to verify. For that I hereby withdraw my post and offer my apologies for the wrongful implication. No problem Alaskazimm. No offense taken. Thanks for apology. 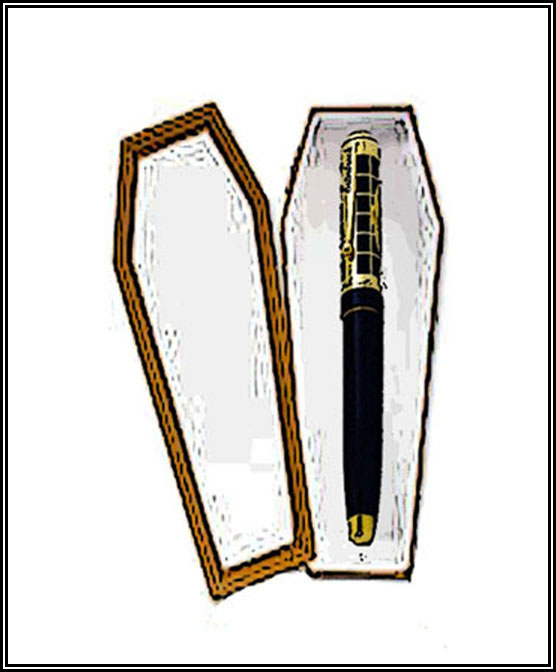 Company is now hardly out of the "egg" and it is proposing to sell a" Limited Edition "
I don't remember seeing an actual piece of wood from Abraham's Coffin embedded in it' pen cap, but then you just might need an act of Congress to make that happen. The Lincoln Pen was going to be available June 25, now (according to the company's FB page) it will be available in July. Not that I am waiting with bated breath. There is just something about the aesthetics that screams cheap Chinese pen to me, and the metal textured section just looks like it will hurt. Maybe the photos don't do it justice. Yeah. Wonder how much it will be? Looking for an Omas Arco Verde...the one that got away. June 25 is the anniversary of the Custer massacre at the Little Big Horn. Pajaro...don't give them (the New Esterbrook Co.) any ideas. Next they'll come up with a commemoration of Grorge Armstrong Custer's Last Stand...maybe a limited edition in blood red.